Hope's Cafe: Buffalo Games Gotcha! Review and Giveaway!! A few months ago I reviewed a game called Truth Be Told, produced by Buffalo Games. Well, I recently had the pleasure of reviewing a new Buffalo Games game, called Gotcha! This is such a fun game! The first time we played, it was a girls night, and talk about a laughter-filled night! The premise of the game is very simple: catch other players breaking the rules, and you win! The game comes with a board, 8 colored pawns, and a deck of rule cards. There are qualifier cards as well. It starts out with 2 rule decks- "Everyone Male" and Everyone Female". But, shuffled throughout the deck are other cards to change those. For example, you can make the rules apply to everyone in jeans, everyone wearing black, everyone with blue eyes (that was a lot of fun the time we played and I was the only one with blue eyes :) etc. Then, the rules...everyone must repeat the last word they say say, say "roger that" after speaking each time, compliment the player on left, plug nose during player on left's entire turn, etc. This game quickly turns hilarious! The whole family loves it! 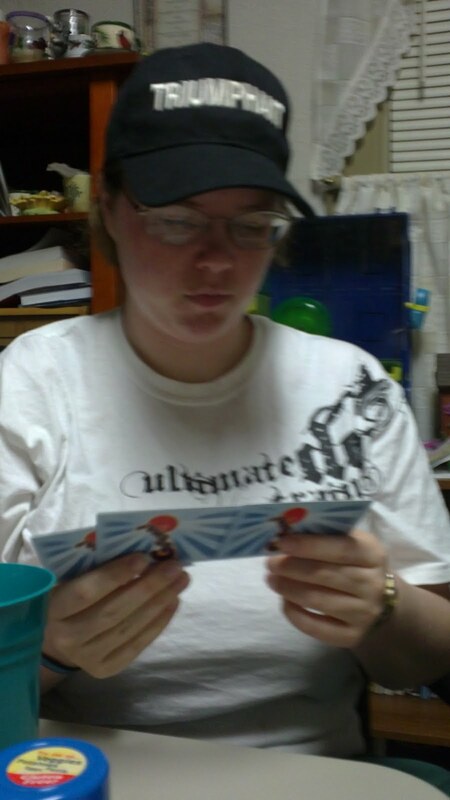 We actually just got done with another game this evening, because M and M were begging to play all day. Seriously, whether you win or lose, you will love playing! It makes a great game for the family, or would be perfect for a party game! We will be bringing ours to visit friends in a couple weeks, and are looking forward to teaching them to play as well! This one got everyone laughing! "Game Description: Gotcha! is the party game that breaks all the rules. In Gotcha!, players race to hit the Buzzer whenever they see someone breaking a rule – all the while making sure they are following the rules themselves. The more rules that are played, the funnier the game gets – a perfect mixture of laugh out loud fun and hectic mayhem! Game Contents: 110 Rule Cards (32 Top Rule Cards, 34 Bottom Rule Cards, 38 Individual Rule Cards, 6 Create-Your-Own Rule Cards); 8 Colored Pawns; 4 Orange Card mats; 1 Buzzer; 1 Gameboard; Instructions." One of my readers will win their own Gotacha! Game!! Go to Buffalo Games and tell me a game or puzzle you would like to get! 1 entry-"Like" Buffalo Games on Facebook; tell them a product you like, and that you came from Hope's Cafe! This giveaway ends Wednesday, May 11, 2011, at 11:59 p.m. Please leave a valid email address in each comment, as this is how the winner will be notified. Winner will have 48 hours to respond, or another winner will be chosen. Disclaimer: I was not monetarily compensated in any way for this post. All thoughts and opinions are mine. All quotes taken from the Buffalo Games. I would like the Truth Be Told game. I entered your mix book giveaway. My friends and I would have a blast with Truth Be Told. Lol. Like Buffalo Games on FB and wrote on their wall. I would like to try the Last Word game!